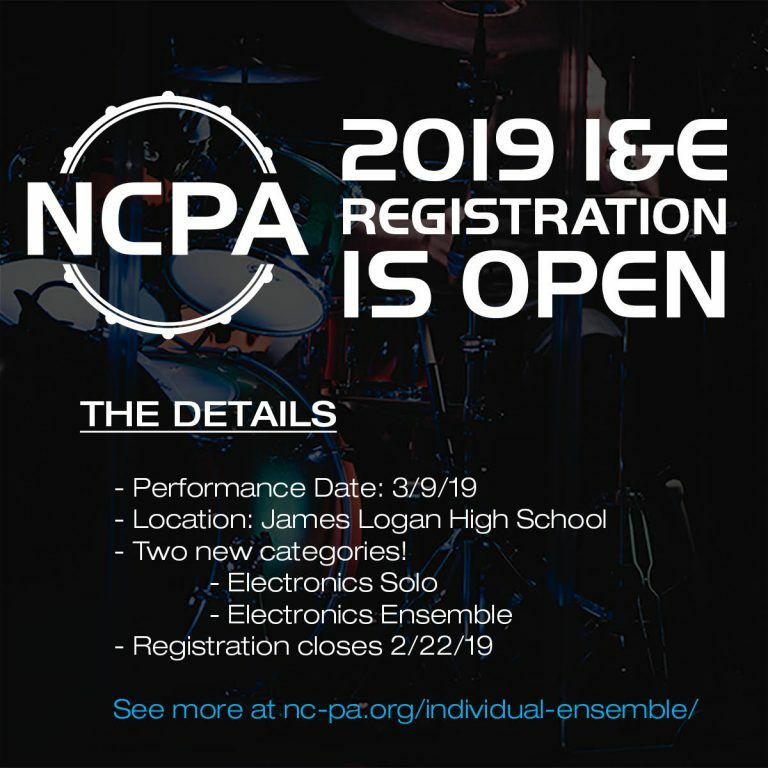 NCPA is excited to offer the opportunity to perform a solo or small ensemble piece at our annual I&E competition as part of the NCPA Event on March 9, 2019, at James Logan High School. I&E competition is open to any indoor percussion or wind student who is currently enrolled in a middle school, junior high school, or high school, or is a member of an ensemble that has competed in the current season (in any circuit). Categories include snare solo, tenor solo, bass drum ensemble, cymbal ensemble, mallet solo, drum set solo, wind solo, wind ensemble, percussion ensemble, general percussion solo, and electronics. You may participate in more than one ensemble, however, an ensemble may only compete once in the percussion or wind ensemble categories. Please register separately for each solo category you plan to compete in; ensembles require one registration per ensemble. The complete rulebook can be found here: NCPA I&E Rules 2019. The contest fee is per person (including each member of an ensemble) and will be collected online during the registration process. The fee for students whose ensemble has competed or will be competing at an NCPA event this season is $10. The fee for students from non-current NCPA ensembles is $20. Performance order will be determined by the contest administrators based on best event flow. The schedule will be posted within a few days after registration closes. Registration closes at midnight on Friday, February 22, 2019.